This property is being sold as the perfect haven for a New Yorker who needs an escape upstate. Located at 287 Marcott Road, in Stone Ridge, it’s a sprawling 15 acres that’s just 80 minutes from Manhattan and 20 minutes from the Amtrak station. 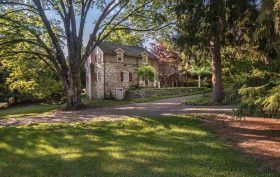 On all that land is an 1800s stone structure, which has been renovated and is used as the main house, a heated in-ground pool and a guest house, all surrounded by forest. And it’s asking about the price of a one-bedroom apartment in Manhattan, $915,000.